Mindful play is a great way for kids to develop focusing skills while learning to regulate their emotions and respond to any situation calmly, with kindness and compassion. Mindful Games offers sixty simple and accessible games that can bring mindfulness to your daily routine. In a playful way, these mindfulness-based activities introduce practices that develop focus, concentration, and sensory awareness, while helping kids and their parents identify and regulate their emotions. Activities include "anchor" games that develop concentration; visualization games that encourage kindness and focus; analytical games that cultivate clear thinking; and awareness games that develop all of these qualities and give kids greater insight into other people, their relationships, and themselves. 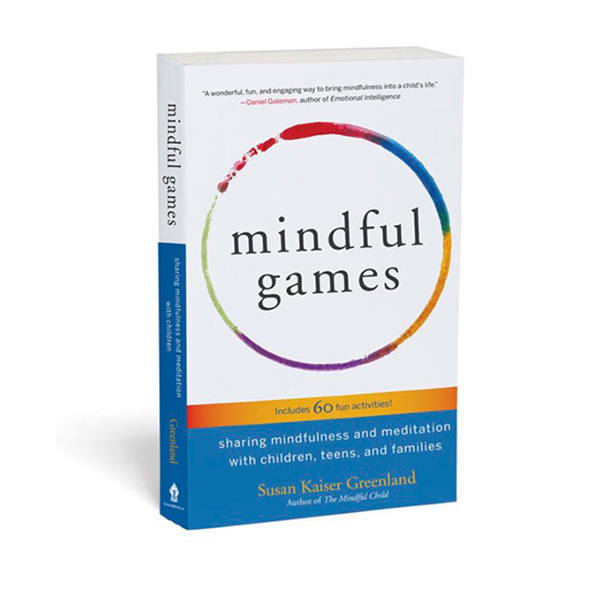 The Mindful Games Activity Cards are the perfect companion to the Mindful Games book. This deck of fifty-five delightful games, developed and tested over many years of working with children and their caregivers, are designed for kids, but they can be just as fun and transformative for adults! Chinese: published by China Machine Press/Beijing Huazhang Graphics & Information Co.
Korean: published by Bulkwang Media Co.
We pretend to rock a stuffed animal to sleep on our bellies to relax our bodies and quiet our minds.